If you are looking for a professional grade high quality high resolution monitor then you are on the right page. It’s not cheap but remember, this is an ultra high resolution 32″ model aimed at those looking for top quality. Featuring a 12 bit lookup table for extreme colour accuracy and advanced calibration options this is made to keep the discerning graphics artist content. I always think higher resolutions are better suited to larger monitors and at 32″ the 3,840 x 2,160 resolution is perfect. It is based on an IPS panel which is known for better colour accuracy and better viewing angles than the most common rival. Large monitors are typically heavy and need a steady stand to support them. This model is able to rotate, tilt and swivel as well as go up and down. It also has VESA attachments and I recommend buying a monitor stand, my own monitors are mounted in this way and it really helps keep the desk clear, more space for all of my clutter! You can hook this up to your PC via the HDMI or DisplayPort sockets, both of these modern standards are able to carry 3,840 x 2,160 at 60hz. USB Ports, headphone sockets and even a pair of 3W speakers are thrown into the mix too. You’d hope so at this price. The overall design is fairly familiar if you’ve seen ASUS monitors before. I think this is a good thing, although looks are always subjective. The overall feel is that of a sleek professional monitor with slim bezels and a relatively small footprint for a 32″ model. The ASUS comes with multiple preset configurations available to you, with names such as Scenery, Reading, and Darkroom. Each one is factory pre-calibrated to guarantee industry-leading colour accuracy (∆E ≤ 2), featuring true 10-bit colour capable of displaying over one billion colours. Professionals will also make use of the advanced colour settings for Six-Axis Hue and Saturation adjustments, as well as RGB gain and RGB offset adjustments. ASUS have also built in a few productivity features that might be useful. For example, the QuickFit option that overlays paper sizes onto the screen so you can organise images against real sizes, or you can use the picture in picture feature to show images from multiple sources at the same time. As you’d hope, the professional testers are reporting back excellent results from the PA328Q, highlighting the rich, vibrant colours and sharp image detail. Games will look stunning at “4k” resolution, but note that this model is clearly not optimised for a low latency environment. You’ll also need a very powerful graphics card to get good performance at this resolution. We give the Asus PA328Q a 4.5 out of 5 rating. Want to know what existing owners of the monitor think? You can read real user reviews here. 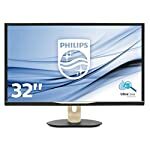 Should I buy the Asus PA328Q? A professional monitor that delivers what's needed for graphics artists. If you are a digital artist, designer of photographer looking for top notch image quality then the PA32Q is for you. If you are unfamiliar with the world of colour calibration and have no intention of getting your hands dirty, you might want to look at something cheaper. If you are having some doubts about this purchase then why not read some real owner reviews and see what other buyers think.